Cauliflower can be made by made by any means as per the requirement of the people. 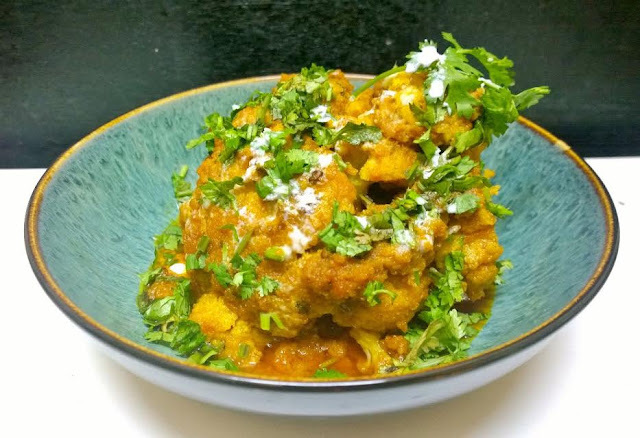 Muglai cauliflower is a very rich type of recipe which people make as per their taste. Mussallam Cauliflower is mostly eaten with Rumali roti or laccha paratha, Gobhi Mussallam is one of my favorite vegetable and during winters, I love having then with paratha. Discard the stem and leaves from the cauliflower and keep it in salted water for 15 minutes. Dry roast kasoori methi and crush them into fine powder. Heat oil in a large and heavy bottomed pan. Crackle the methi dana, clove and green cardamom. Saute the sliced onion, ginger, garlic paste together. Now add onion paste and fry till it turns golden. Add dry spices, stir and cook them for 2 minutes. Add tomato puree and 1/2 cup of water. Cook the gravy till the oil separates. Add curd and kasoori methi powder and cashew nut paste, Mix well with all spices the gently put the cauliflower cover with spices. Cover and cook the cauliflower for 10 to 12 minuets. Switch off the gas. Open the lid add garam masala, Heat the ghee in a pan. Put the cauliflower carefully in the ghee and fry it for 5 to 6 minutes. Turn off the heat. Keep in serving bowl, garnish with cream and coriander leaves. Serve with laccha paratha or chapati. Note :- Do not over cook the cauliflower .